If your back is hurting, you want relief and you want it quick. 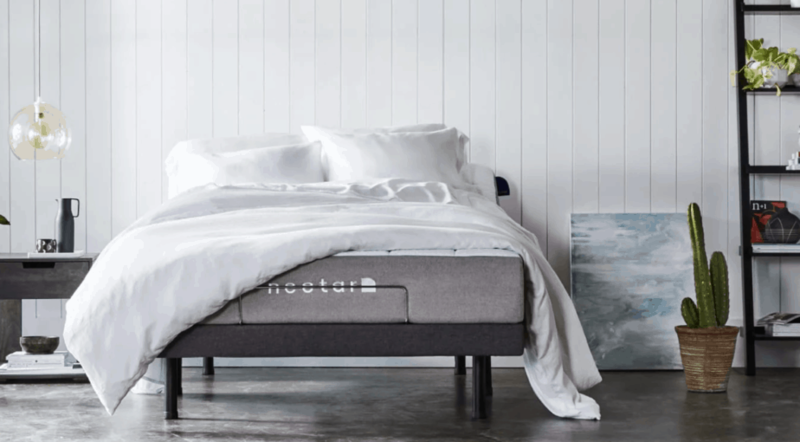 So we’ll get to the point: Our pick for the best mattress for back pain is the Nectar Mattress. It’s both firm and giving, keeping your spine aligned and helping your back feel better. Sleep on this mattress, and you’ll wake up refreshed and ready to face your day. Does your back hurt in the morning? It’s probably your mattress. Do you wake up a lot throughout the night with back pain, or find yourself tossing and turning to get comfortable? It’s probably your mattress. An old, low-quality, or otherwise unsuitable mattress can worsen back pain from a health condition or injury. Your mattress itself can even be the direct cause of back pain. Find out how to identify the right mattress to help your bad back feel better with our ranking of the 10 best mattresses for back pain. 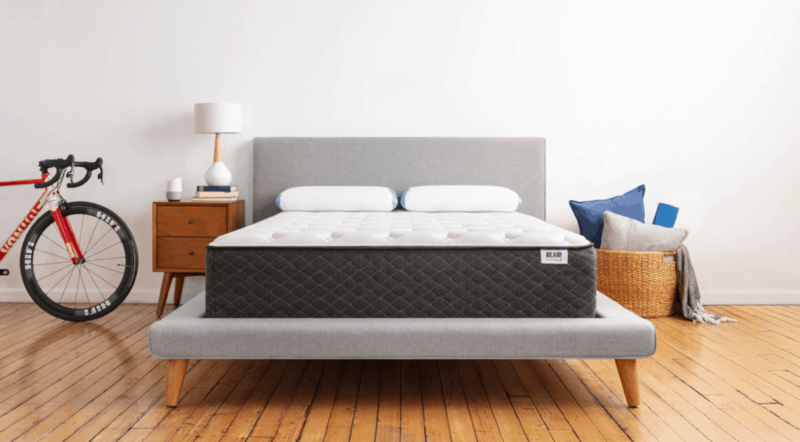 And if you’d like to see our favorite mattresses for joint pain — and our favorite adjustable mattresses, and organic mattresses, and a whole lot more besides — don’t miss our overall ranking of the best mattresses. A bad mattress can put you in a world of hurt. Find relief with these top picks. Get the pain-free sleep you need with Nectar. This mattress will help relieve your aches and pains with just the right mix of support and softness. Using proprietary adaptive foam to help you sleep cool, Tuft & Needle mattresses also provide great pressure relief where you need it most. With its unique “coil on coil” construction, the Saatva mattress offers 2 zones of comfort to help your back feel better so that you get the rest you deserve. Do you sleep on your stomach, your back, or your side? Maybe you sleep upside down. It really doesn’t matter, because a bad mattress can cause back pain no matter what your preferred sleeping position might be. 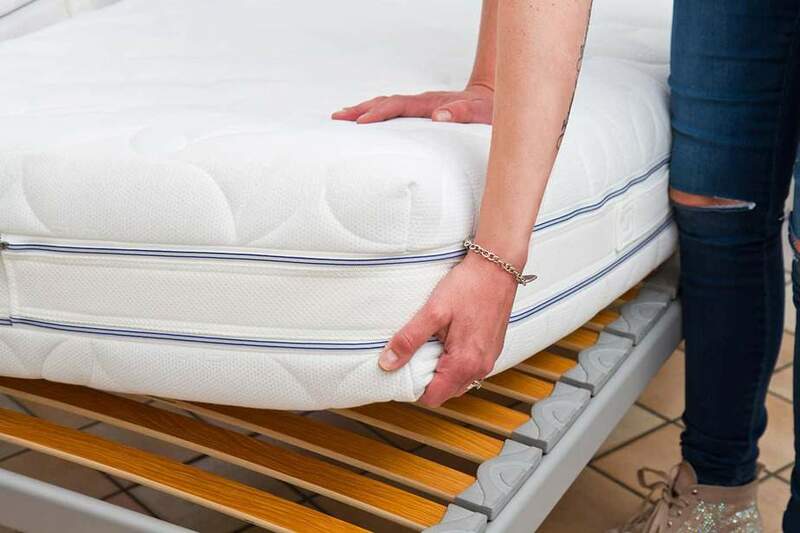 If your mattress is too hard, it can push on pressure points, creating misalignment and causing you pain. If it’s too soft, your body sinks into the bed, resulting in bad posture — which can also lead to back pain. The right mattress will help you maintain correct sleeping posture. After all, you can spend up to 9 hours a day on your mattress, so it should be comfortable. See your chiropractor: Before you jump into buying a new mattress, get an adjustment from your chiropractor. Listen to their advice on the best sleeping position for you, as well as any pointers on how to improve your posture. Stretch your back: Just a few moments of stretching before getting into bed and after getting out of bed can increase spine flexibility and reduce pain. Change your sleeping position: If you’re prone to back pain, experts recommend sleeping on your side with a pillow between your legs. This position helps support your hips and lower back. Change your pillow: The wrong pillow can contribute to back and neck pain. 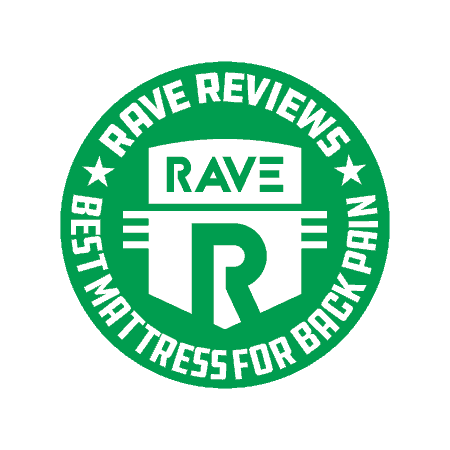 Check out RAVE’s ranking of the 10 best pillows for neck pain. But if none of those steps have fully resolved your back pain, then a new mattress is the way to go. You’re experiencing back pain, and you’ve decided it’s time to replace your mattress. You’ve established your budget, and it’s time to start shopping. But what else should you consider before making your mattress-buying decision? Here are some terms to look out for while shopping for a new mattress. If you understand what these terms mean, you’re more likely to end up with a mattress that’s exactly what you want. 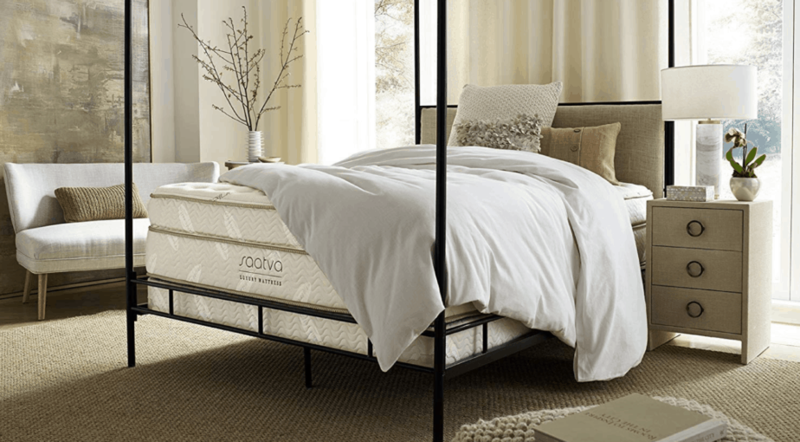 Memory foam mattresses: Memory foam mattresses are some of the most popular on the market, thanks to their supportive, pressure-relieving qualities. However, they tend to retain a lot of body heat, and some sleepers don’t like how far they sink into this type of material. Latex mattresses: If you prefer a springy mattress, look for latex. To get a feel for exactly how firm your mattress will be, look at the density and thickness of the material. These are some of the priciest options on the market. Innerspring mattresses: Innerspring mattresses are bouncy. They tend to minimize motion transfer when your sleeping partner gets out of bed or moves around at night, but they’re not as durable as other types. Air-filled mattress: If you like more control over your sleeping surface, consider an air-filled mattress. Air-filled mattresses allow you to adjust the amount of air in the mattress via remote control. You and your partner can even set up separate firmness preferences. Your preferred sleeping position is an important factor in choosing a mattress. If you sleep on your side, we suggest a memory foam mattress. If sleeping on your stomach is more your style, you might prefer a hybrid mattress, dense innerspring, or an air-filled mattress. If you like to sleep on your back, your options are a little more open. Try out all sorts of mattresses to find out which one suits you best. Do you or your partner toss and turn a lot? If so, consider a memory foam or latex mattress to keep motion transfer to a minimum. If you’re a back sleeper with back pain, pick a mattress firm enough to support your back, but still soft enough to conform to your body. If you’re a stomach sleeper with back pain, select a firmer mattress to keep your spine properly aligned. Side sleepers with back pain should pick a slightly softer mattress that allows the hip and shoulder to sink. Got it? Good. Up next, it’s our ranking of the 10 best mattresses for back pain. As we compiled this ranking, we carefully examined the advantages and drawbacks of dozens of mattress models from a wide variety of brands. We triangulated similar lists from authoritative sites across the internet, while also taking into account the opinions of industry professionals and the hundreds of customers who’ve tried, tested, and approved these products. Given our extensive analysis, we feel confident this ranking will help you find the best mattress for back pain. Nectar is our pick for the best mattress for back pain because of its truly unique design. 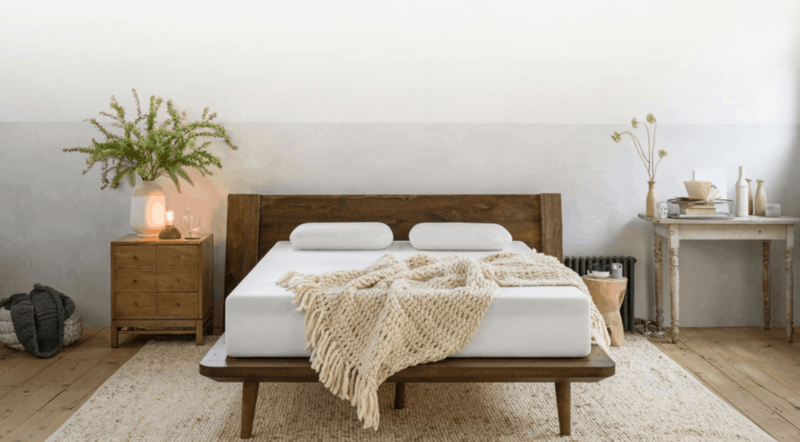 The layered construction of this mattress includes a Tencel cooling cover, gel memory foam, adaptive core memory foam, and a breathable base layer. All these layers work together to keep you cool and comfortable while you sleep, regulating heat to maintain an ideal temperature all night. The mattress is made from high-quality materials, and it’s Certi-PUR-US certified — meaning no ozone depleters, PBDEs, TDCPP, mercury, or lead. Another reason Nectar ranks so high is because with your purchase of the queen mattress, you’ll get 2 free premium Nectar pillows, a $150 value. Nectar also offers an industry-leading 180-night home trial. And their mattresses are covered by Nectar’s Forever Warranty — the longest warranty in the business. Saatva mattresses are built with “coil on coil” construction, a unique feature which creates 2 zones of comfort, a unique system that contributes to Saatva coming in at second on our list. The lower zone consists of a connected, hourglass shaped steel support base, while the top zone is an individually wrapped coil system, meant to contour to your body while eliminating most motion transfer. This unique construction is also coupled with an advanced euro pillow top, a premium feature. The mattress works with adjustable bases, and are made to last 10 to 15 years, continuing to perform well over time. With Saatva, you’ll also get a dual perimeter edge support system, with lumbar support enhancement. And you can feel good about your purchase since Saatva mattresses are very eco-friendly: from an organic cotton outer cover, to inner springs made from recycled steel, and exclusive botanical antimicrobial fabric treatments. All Saatva coil units are tempered 3 times and oven baked, and the mattresses come in a broad range of comfort — from soft to firm, though Saatva does not recommend their mattresses for individuals looking for the extreme ends of the comfort spectrum. 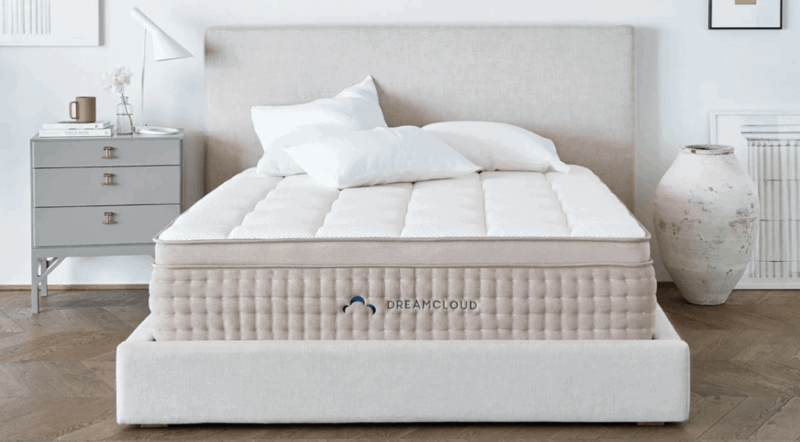 With DreamCloud’s Luxury Hybrid Mattress, you’ll get 8 layers of scientifically optimized materials, including premium gel-infused memory foam that provides heat distribution while supporting the contours of a sleeper’s body. The bed is organized into 5 unique zones of comfort. 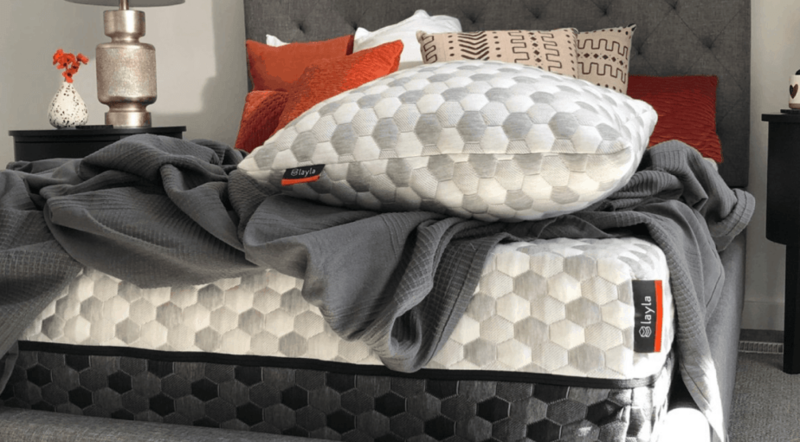 The patented ”BestRest” Coils provide support, and a hand-tufted cashmere blend cover allows optimal breathability and top-of-the-line softness. DreamCloud mattresses are CertiPUR-US certified and low VOC. They fall under the company’s Everlong limited warranty. That’s not the most thorough warranty in the industry, contributing to our decision to bump the DreamCloud a little further down in our ranking, despite the quality of the mattresses. DreamCloud mattresses are guaranteed, however, to be free from defects in workmanship and materials for as long as you own and use the mattress. Purple ranks in our top 5 mattresses for back pain because of how well it supports proper spine alignment. The mattress is constructed from 2 layers of CertiPUR-US certified polyurethane foam with a Smart Comfort Grid system. This unique feature dynamically flexes to either support or sink, depending on the amount of weight applied. It offers a truly custom sleep experience for every person. With Purple’s Smart Comfort Grid, you’ll also get motion isolation, helping minimize movement if your partner tends to toss and turn at night. And there are free-flowing air channels to prevent heat from being trapped — unlike many memory foam and latex mattresses. The mattress is naturally antimicrobial with no artificial germicides. Construction materials — like the patented hyper-elastic polymer — protect against allergens and dust mites, and are FDA-certified for safety. Overall, this is a fine mattress that would have ranked a little higher if not for reported issues with off-gassing at delivery, as well as compression over time. The Sapira Mattress is a great mattress for back pain because it responds and adapts to different body types, gently pushing back on pressure points all night long. The mattress combines premium foam layers with individually wrapped pocket springs, creating superior support. There’s a cooling Avena foam top layer, as well as a contouring memory foam recovery layer and an active pocket spring layer with extra edge support. It’s worth noting that some sleepers report Leesa mattresses are firmer than expected. Leesa is conscious of their social impact, donating a mattress for every 10 they sell. Leesa also plants one tree for every mattress sold, and the company prioritizes volunteerism in their local community. The Sapira mattress is made in the USA. Your purchase from Leesa will include a 100-night in-home trial backed by a full refund policy. The Tuft & Needle mattress is constructed with proprietary T&N Adaptive Foam, creating bounce but also support. 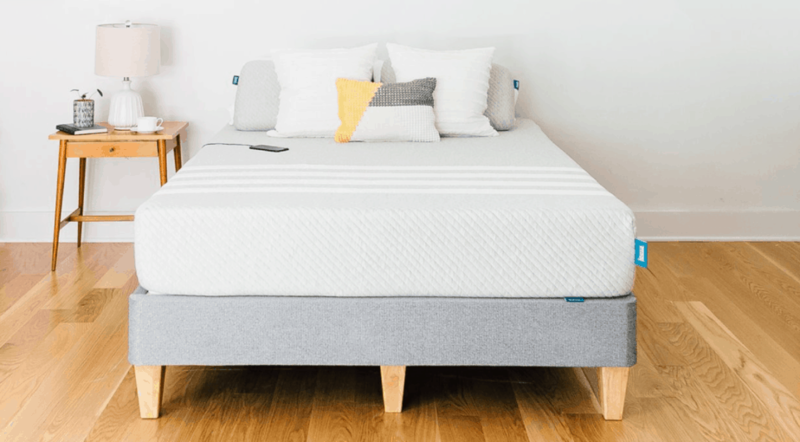 There are no coils in the mattress, however, limiting the versatility of the mattress for different sleeping styles — the biggest reason we rank Tuft & Needle outside of our top 5. Nevertheless, the T&N foam — more advanced than standard latex or memory foam — sleeps cool, with just the right mix of soft and firm. It offers great pressure relief and “localized bounce,” which is ideal for those with back pain. There’s also a poly-blend plush cover that’s ultra-soft to the touch, while remaining breathable and heat-wicking. Choosing Tuft & Needle is a no-risk purchase, with a full refund guarantee. Take advantage of the 100-night sleep trial plus a 10-year limited warranty. The mattress fits all foundations, and it holds GREENGUARD Gold and CertiPUR-US certification. The mattress is also tested and certified by OEKO-TEX to be free from chemical residues, phthalates, and heavy metals. It’s made in the USA. The memory foam mattress from Loom & Leaf is engineered with 4 layers, including premium, high-density memory foam. This mattress sleeps cool, with a non-toxic, proprietary cooling gel layer. And it’s all as eco-friendly as possible, coming complete with an organic cotton pillow top, as well as eco-friendly foam and a natural thistle flame retardant. Other mattress features include an exclusive Guardin antimicrobial treatment. Loom & Leaf mattresses are available in multiple comfort levels, and they don’t ship in a box — meaning they won’t have to expand after shipping. Each and every mattress is shipped and installed for free. 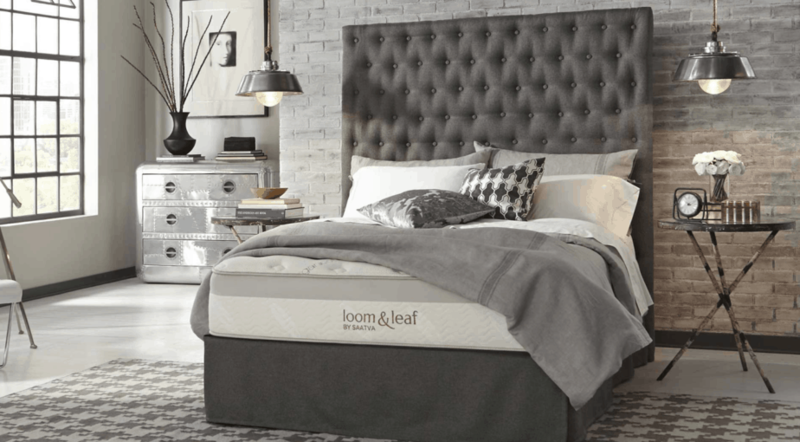 Available only online, Loom & Leaf eliminates the overhead of retail stores, so you get a premium mattress at a great price. But Loom & Leaf is not for consumers looking to try out their mattress in a traditional, brick ‘n’ mortar store. However, Loom & Leaf does offer a 120-night trial, free shipping and setup, a 15-year warranty, and great customer service 24/7. The Helix Moonlight uses proprietary Helix Dynamic Foam to conform to all sorts of body shapes. 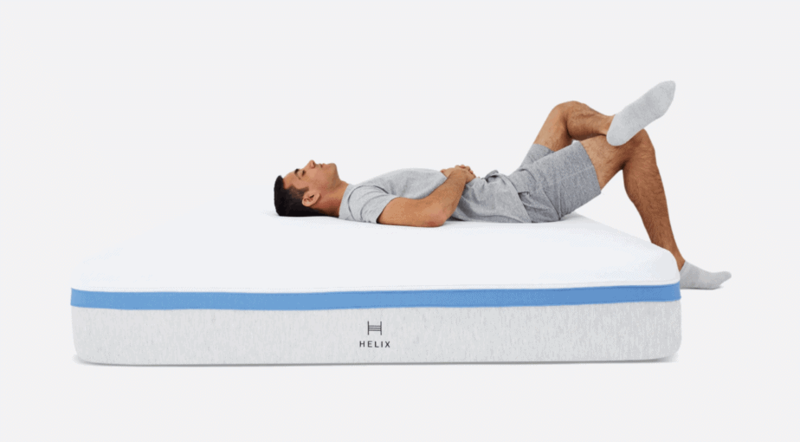 However, heavier-weight sleepers do sometimes report discomfort with the Helix Moonlight, a contributing factor to the mattress ranking a little lower down on our list. The mattress is very soft, with density in the top and middle layers optimized to support back and stomach sleepers. Helix helps prevent waking up too hot or too cold with a breathable design for improved airflow and less heat retention. The mattress is also known for best-in-class edge support, with a reinforced perimeter and hundreds of individual wrapped coils. There’s also a 100-night sleep trial, and a 10-year limited warranty. Upgrade to Moonlight Luxe for increased lumbar support, additional comfort layers, and a premium pillow top. The Bear Hybrid mattress features a hand-quilted Celliant Fiber top, which converts body heat into infrared light. That infrared light is then reflected back to the body, increasing tissue oxygenation and improving blood circulation. This type of material has been clinically proven to improve sleep quality. The mattress’ premium comfort foam adapts to all body types and sleep positions. The responsive transition foam is designed to achieve optimum airflow and pressure relief, while the quantum edge coil system creates superior edge support. The mattress is also highly durable, with high-density support foam and individually wrapped coils, providing excellent lumbar support, optimal spinal alignment, and incomparable pressure relief — no matter what a sleeper’s preferred sleep position may be. There’s no doubt that this is a great mattress for back pain, but considering what our other winners offer at a much lower price point, the cost of the Bear Hybrid is what knocks it down our list. Sleepers who tend to sleep hot should consider the Layla Mattress. This mattress has a copper-infused cooling system, and the thermogel-infused cover creates excellent heat dispersion. The Layla offers another unique feature: It’s got 2 firmness levels wrapped up in one mattress. It’s medium soft on one side, and firm on the other. The mattress works on any foundation, it’s CertiPUR-US certified, and it is made in the USA. When you buy from Layla, you’re making a difference. The brand partners with a San Francisco homeless shelter. For every mattress sold, Layla will help provide the opportunity for someone in need to sleep on a bed. When it comes to refunds, Layla will help facilitate the donation of the mattress to a local charity. Simply provide paperwork proof of the donation, and you’ll receive a full refund. But despite a 120-night free trial, and Layla’s admirable commitment to social responsibility, this unconventional refund policy does make us hesitant to rank Layla any higher on our list. You’ve picked out the best mattress for back pain. Relief is in sight. Now, let’s look at a few other commonly asked questions about the mattress-buying process. What is the best month to buy a mattress? You might not expect the month in which you buy your mattress to have much effect on the price. But the fact of the matter is it does make a difference. May is the best month to buy a mattress. The mattress industry tends to bring out new products in June, with peak selling season lasting through September. By May, companies are looking to clear out their older models, and offering big discounts. Prices online are often lower than in brick ‘n’ mortar stores, and you can buy from anywhere in the world and have it delivered to your doorstep. Buying online, however, prevents you from testing the feel of the mattress before making your purchase — a definite disadvantage compared to buying a mattress the old-fashioned way. Because it’s in May, Memorial Day might be the best time to buy a mattress. Other holidays during which mattresses are often discounted include Labor Day, the 4th of July, President’s Day, and Martin Luther King, Jr. Day. Shopping on Cyber Monday, on Amazon Prime Day, or from a store that’s going out of business or having an overstock sale can also save you a few dollars on a new mattress. Mattresses are pretty expensive. But if you take a deep dive into the numbers, you’ll see a new mattress is worth the investment. The average cost of a mattress is about $2,500. Not cheap. But if you break that down based on how many days there are in a year, that becomes roughly $6.86 a day. And if you’re sleeping for an average of 8 hours a night (“yeah, right,” we scoff — but seriously, do at least try to listen to your doctor on this one), that’s $0.85 per hour spent sleeping on your new mattress. Share your mattress with a partner, and that number becomes a mere $0.43 per hour. Pick a high-quality mattress, and the sleep you’ll get will make that price more than worth it. Why is sleep so important? Sleep affects mental and physical health, and getting enough of it can improve the quality of almost all aspects of your waking life. The right amount of sleep will boost productivity, improve emotional balance, and strengthen the immune system, as well as promote the health of the brain and heart. You didn’t know you were getting so much done while you were asleep, did you? Investing in the best mattress for your back pain will not only help your back feel better — it will make YOU feel better. How can you put a price on that? You want a mattress firm enough to support your pressure points. You want a mattress soft enough to contour to your body. You need a mattress that will suit your preferred sleeping position. In other words, you need a mattress that’s just right. To find that mattress, you may need to test out a few, and you might want to consult with a medical professional before you make a final decision. Our overall winner for the best mattress for back pain is the Nectar Mattress. Capable of molding to anyone’s body, the Nectar Mattress provides optimal firmness, while also keeping you cool and comfortable. It’s firm enough to support you where you need support, but also gentle and soft for unmatched comfort. If you prefer a coil mattress, our pick for the best mattress for back pain is the Saatva Mattress. Featuring unique “coil on coil” construction, the Saatva has 2 comfort zones to help you get the rest you need — a lower zone of connected, hourglass-shaped steel coils, and a top zone to contour to your body shape. And if a foam mattress is more your style, go for the Tuft & Needle Mattress. Constructed from proprietary T&N Adaptive Foam, this mattress provides support, while remaining adaptable to all sorts of sleeping positions. Buying the best mattress for back pain isn’t the only thing you can do to get a better night’s sleep. 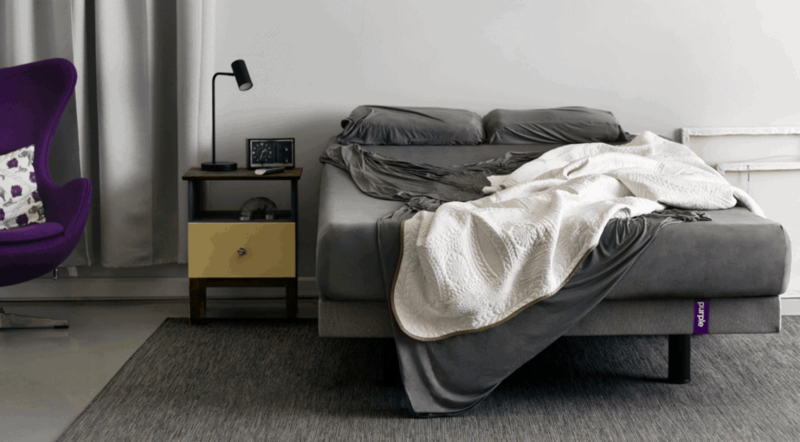 Check out these 5 great mattress accessories, and we’ll see you in the morning. G’night! DMI Folding Bed Board Mattress Support: Add extra firmness and support to any bed with the DMI Bed Board. Try it, and you’ll enjoy better back support, improved spinal alignment, and increased blood flow. Bed Band Bed Sheet Holder, Gripper, Suspender, and Strap: Keep your sheets smooth and comfy with this bed band. Gorilla Grip Original Slip-Resistant Mattress Gripper Pad: Help stop your bed and topper from sliding with this gripper pad from Gorilla. Also works on couches and sofas. Everest Polyzip Box Spring/Mattress Encasement: Keep your mattress extra hygienic with this polyester mattress encasement from Everest. ZIRAKI Memory Foam Lumbar Cushion: Get extra relief from back pain with this memory foam lumbar cushion from ZIRAKI.